Learning for the sake of learning is a great idea—students are able to learn what they want and focus on anything of interest. Sounds great, right? Our schools, and in particular our public educational system, exist in part to fill the needs of the careers that our country needs. This isn’t the sole reason that we educate our students, but it is definitely part of it. And rather than just teaching students what may interest them, we attempt to prepare them for specific careers that they can easily transition into after high school or other post-secondary education. This has been a focus of the newer standards that have come out over the past decade. Students should be both career and college ready when they leave high school. Schools have been focused on preparing students to be college ready, but what does "career ready" really mean and how are schools achieving that? Schools and districts have developed integrated approaches to teaching technical job skills and core content at the same time. This concept is called career and technical education (CTE). While the concept isn’t new, there is a renewed emphasis from all levels of education. The origin of CTE goes back a few years and has a history of widespread support from all political spectrums. Here is a good visual for the history of CTE. The funding, in particular the Carl D. Perkins Career and Technical Education Act of 2006, has played a large role. In 2016, Congress began working on increased flexibility and funding for Perkins. At the highest levels, leaders see a need for improving the technical knowledge and skills of our students to better prepare them for the workplace of the future. It is important to define career and technical education to make sure there is some clarity on the topic at hand. What does this look like at a school level? To summarize, CTE is a school-based curriculum that is designed to align with industry standards. Students in CTE courses will find themselves using the actual tools that professionals in industry may use. CTE courses also try to create a progression of learning for students, starting with a baseline knowledge that anyone in the field might need, and then expanding to more technical and specific knowledge that might be needed for particular skill sets and trades. Finally, and ideally, the student ends the progress with some worksite experience to really get a feel for what the career is like. Numerous STEM fields are perfect for CTE courses. Engineering, healthcare, and computer science are all examples of pathways that fill a need for workers in the future and fit perfectly into the model of education that CTE promotes. Students can start in their science class—typically a course like biology or physics—and then branch out into another science area that they are interested in. 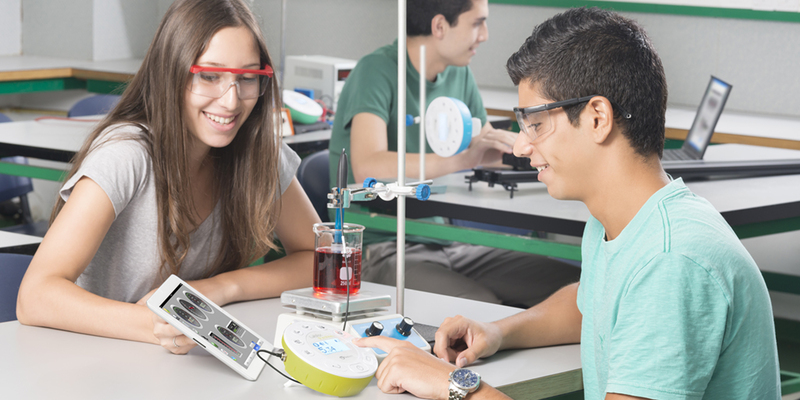 As students do various labs with their Boxlight Labdisc portable lab, they can see which realms of science they might be best suited for. They can use this knowledge to select a more technical class on the next level that may lead to a future career. As you can see, there are numerous benefits to this progression from the perspective of industry. Students who are “completers” in different pathways of CTE strands often graduate with the certification or credentials to actually put into practice the skills they have obtained. Also, students have a great idea of what the job really entails. Instead of just picking a job at a career fair that sounds fun, the student can really have a feel for what the day-to-day workings of a position really are. There can also be a downside to this from the student’s perspective. Courses at the high school level are limited by time and availability, especially at smaller schools. By locking into a “pathway” early on, the student is reducing his or her options for which courses to take. Some students are clear on their future and know the field they want to work in as an adult, but many students are still exploring and should keep their options open (and rightly so). Another downside is that schools can stretch their resources really thin when trying to develop CTE courses. Funding at the state level, Perkins funding, and grants can assist with this problem, but just like students are limited by their availability in the schedule, so are schools in what they can offer. It’s important for schools to offer what is needed for the community and area industries, and to offer what students have an interest in and a desire to take. To read more about the role that CTE can play across the different curricular areas, watch for the second part of our CTE series coming out next week.